It’s funny how “24601” is such a powerful refrain in the musical of Les Misérables, but is barely mentioned in the book. But there is another nickname* that does keep coming up over and over: The Lark, a name given to little Cosette by the people of Montfermeil. She was known locally as l’Alouette, the Lark. The village people, with instinctive symbolism, had thought it a suitable name for the apprehensive, trembling little creature, scarcely more than a bird, who was always first up in that house and out of doors before dawn. But this was a lark that never sang. Hugo even compares her to a lark in the narrator’s voice when describing her sense of adventure, and why she doesn’t spook as much as one might expect when Marius starts creeping around the garden. Cosette was not nervous by nature. There was gipsy blood in her veins, that of a barefooted adventuress. We may recall that she was more like a lark than a dove. She had a wild but courageous heart. The fact that the book keeps coming back to it makes me wonder why the musical dropped it. It’s a great character hook, especially with the songbird angle. Though given the similar vocal profiles and isolated-damsel-in-the-city roles, maybe they wanted to distance her from Johanna in Sweeny Todd, whose signature song is actually about songbirds. *Not counting the zillions of aliases, or the nicknames given to passers-by, or nicknames that characters actually go by. Like, for instance, Cosette, whose real name is Euphrasie. **As it turns out, it’s a good thing he does, because that’s how Éponine finally finds him after she discovers where Cosette lives. This entry was posted in Book Commentary and tagged Cosette, Followup, Lark on June 21, 2014 by Kelson Vibber. Fantine is completely screwed over by the system, partly because options are fewer for women than men, and partly because of the stigma against unwed mothers. Ultimately she ends up in the most degrading profession she can imagine, and dies from inadequate health care. Marius, after falling out with his grandfather, chooses to take no money he hasn’t earned, and doesn’t earn very much. But he’s got options: he’s in school, and he has at least somewhat marketable skills, and of course there’s no stigma against young men. Plus he has a support network so he can crash at a friend’s apartment, or split the cost of the occasional social meal. He scrapes by in a crappy apartment until he earns his degree, but even then, he can’t quite pull himself out by himself, and it’s only after he (a) meets Cosette, who has money and (b) reconciles with his wealthy grandfather and moves back in with him that he’s able to enjoy a higher standard of living. The Thénardiers, after they lose their inn, are in desperate straits, but rather than trying to scrape by, they do what they’ve always done: prey on society. They don’t seem to be very good at it, and while it’s hard to have any pity for the parents, it’s painful to read about how Éponine and Azelma live. Gavroche, a child living on the streets. Of course, a child can get away with breaking a lot more rules than an adult can, and Gavroche is so optimistic he almost doesn’t care. Almost. Finally, Pere Mabeuf, Marius’ friend who lives a modest but comfortable life off a book he published when he was younger, but as his work falls out of demand and he ages out of the job market, he is effectively done in by the lack of support for the elderly. Technically it’s a bullet that kills him, but he only ends up at the barricade because he’s reached the end of his rope and starts walking. There are others: Valjean’s distant past (his role in the novel deals more with the flaws in the justice system than with economic class*), the voluntary austerity of Bishop Myriel and the nuns at the convent, the Thénardiers’ Parisian associates, and of course many nameless background characters, but these are the lives we get to see up close. *It’s worth mentioning that as M. Madeleine, Jean Valjean is the only self-made man in the novel…and even he needed some seed money from an investor to get started. This entry was posted in Book Commentary and tagged Fantine, Followup, Gavroche, Jean Valjean, Mabeuf, Marius, Poverty, Thenardiers on March 23, 2014 by Kelson Vibber. There are a few background characters in Les Misérables who never quite leave. Not just the ones who are associated with another character, like Valejan’s maid Toussaint, or the shopkeeper whom Gavroche bothers on several occasions, but characters who seem like one-offs, but come back anyway. M. Bamatabois, the “gentleman” who attacked Fantine and precipitated her arrest, turns up on the jury of not-Valjean. Boulatruelle, a local ne’r-do-well in Montfermeil, spends years trying to find Valjean’s secret cache of buried bank notes, taking breaks in between to help Thénardier out in his Parisian life of crime. Village women on their way through the wood at first mistook him for Beelzebub and then saw that he was Boulatruelle, which was scarcely more reassuring. Then there’s La Magnon, whom we never actually meet, but hear about on several occasions. She was once a servant of M. Gillenormand, Marius’ grandfather. A year or so after she left, she claimed M. Gillenormand was the father of her child. He took the boy in (arguing that he wasn’t the father, but that he’s perfectly capable of having been even at his age) until she blamed him for another baby, at which point he sent them both back, but continued to pay a stipend. She turns out to be a friend of Mme. Thénardier, and one of the contacts on the outside after everyone is arrested following the botched extortion attempt against Jean Valjean. 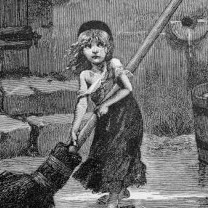 Even stranger: Her own two children died at a young age, but in order to keep getting her allowance from M. Gillenormand, she got the Thénardiers to give her their two youngest children, Gavroche’s younger brothers. 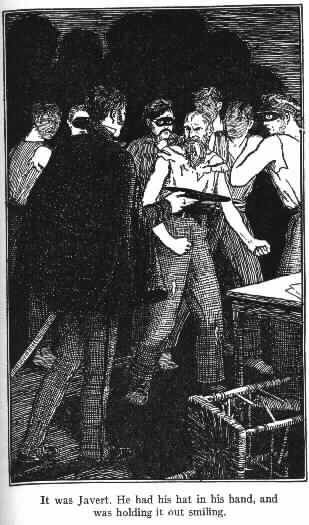 A second round of arrests after the extortion leaves the two boys alone on the streets, where they run into the ultimate Paris urchin: Gavroche. She disappears at that point, but it’s a long thread for someone who initially seemed to serve only as part of the background for another character. This entry was posted in Book Commentary and tagged Bamatabois, Boulatruelle, Followup, Gavroche's Brothers, Magnon on March 2, 2014 by Kelson Vibber.